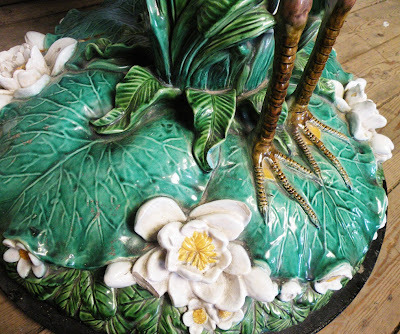 At auction April 18, 2012 is a rare Mintons majolica fountain basin, date code for 1883, after a design by John Thomas, formed as a large turquoise glazed scallop shell supported on the wings of a stork and surrounded by bulrushes, water lilies and calla lilies, on a moulded plinth in green, yellow and blue glazes, (at fault) overall height 84cm, 65cm wide. 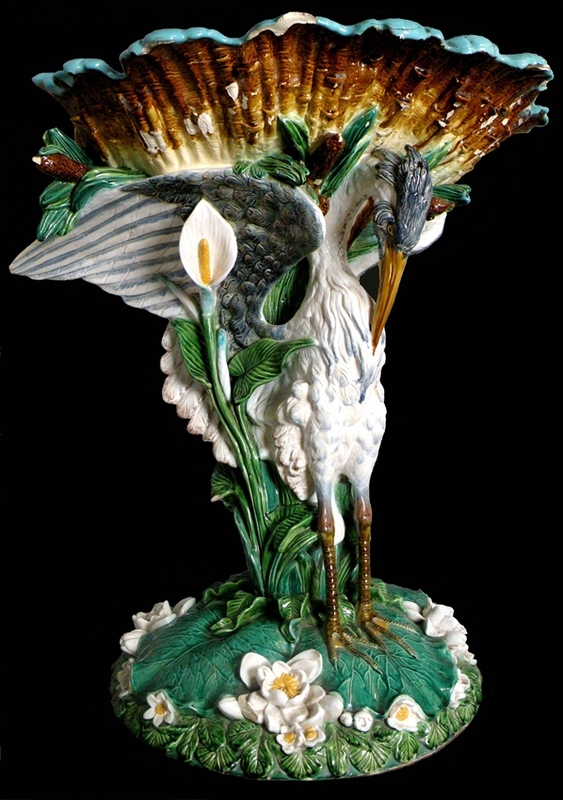 This stork fountain basin was originally designed in 1858 by John Thomas (1813-1862) in conjunction with Prince Albert for Minton's scheme for the Royal Dairy at the Model Farms, F rogmore, which the Illustrated London News praised as 'a perfect gem of taste and art'. It was later translated into the 'St. George and the Dragon' fountain made by Minton for the London International Exhibition of 1862. The fountain was 36 feet high and constructed of stone and majolica and surmounted by a figure of Saint George and the Dragon, consisting of 379 pieces. Below the central monumental Saint George and the Dragon sculpture were smaller majolica fountains supported by heraldic British lions and on the next tier, stork and shell fountains similar to this present lot. 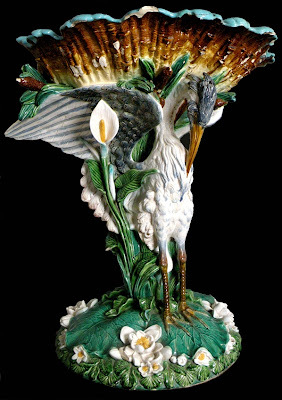 A stork fountain was also featured in the Philadelphia Exhibition of 1876 and then Christies sold a similar or perhaps the same Philadelphia, stork fountain, dated 1874, Lot 280, Sale 2210, New York, 20th October 2009. See Marilyn G. Karmason and Joan B. Stacke, Majolica, A Complete History and Illustrated Survey, Harry N. Abrams, New York, 1989 pages 61-63 for an illustration of the London 1862 Exhibition fountain and accompanying text. See also V & A Online Journal Issue No 3 Spring 2011 ISSN 2043-667X 'John Thomas and his wonderful facility of invention: Revisiting a neglected sculptor' by Ian Blatchford, Director, Science Museum, London. Please do not hesitate to contact Meg Randell if you require any further information. Phone number is 01743 284 777, and I would be delighted to discuss the fountain.